The Breeders Cup holds a special place on the horse racing calendar. 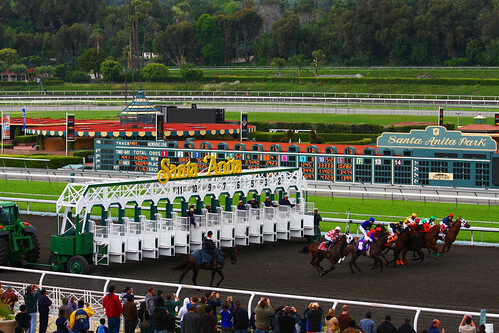 This year, the event will be held at the storied Santa Anita Racetrack in Arcadia, California. Fifteen races will be run over the course of two days, on November 1st and 2nd. This is one of the richest weekends of the year for thoroughbred owners. Over $25 million in prize money is up for grabs. The headlining race, the Breeders Cup Classic, by itself, is worth $5 million. While it is not part of the historic Triple Crown, the Breeders Cup's prize money draws the world's best horses, trainers, and jockeys. This year, the buzz surrounding the event earned it something that is very, very rare in the sport of thoroughbred racing: prime-time broadcast network television coverage. That's right, the aforementioned $5 million Breeders Cup Classic will be televised live, in prime-time, on NBC. Because of its location in the heart of Southern California, not far from Downtown Los Angeles, Hollywood, Beverly Hills and the Pacific coastline, this year's Breeders Cup is especially attractive for people seeking to do more than drop a few dollars on a long shot. With glamorous events surrounding the races, world class restaurants and nightlife venues nearby, and plenty of options for renting an estate to host your own Los Angeles area Breeders Cup party, this is the perfect time to go all out and truly celebrate the Sport of Kings. Plenty of celebrity sightings are expected at Santa Anita on race weekend, both trackside and at the exclusive events that are held in the days leading up to the first starting gun. For people who want to put their stamp on the pre- or post-race party scene by hosting their own event for friends, business associates or fellow executives, there are a large number of event venue choices within a 30-minute drive of the Santa Anita grandstand. The Rooftop Gardens, in the heart of Los Angeles, is always a popular choice, especially for cocktail parties. The spacious open air rooftop has just the right mix of relaxing atmosphere, classy design, and exclusive feel. What better way to cap off a day at the races than with a cocktail in hand, surrounded by beautiful gardens and gazing over the skyline of Downtown Los Angeles? Catering services are available, so all that you have to do to host a Breeders Cup after-party is to contact the estates' managers and reserve your night before some other soiree-planner does. Another event venue option sits in the Hollywood Hills, also only a half-hour from the race track. The Hollywood Grand Mansion provides beautiful views of Los Angeles from one of the most exclusive neighborhoods in all of Southern California. This is the kind of venue that will impress even the most-veteran post-race party-goers. The estate's four floors are connected with an elevator, and the expansive and thoroughly modern common areas can accommodate up to 200 people while providing them with 270-degree views of the city skyline. The Mansion certainly earns its name, with 10 onsite luxury suites where your most-special guests can spend the night. Like the Rooftop Gardens, this is a full service estate, so all that is required for hosting a party is a call to the estate managers to reserve the property and organize catering and event staff. Perhaps you don't want to throw a party or host a corporate event that coincides with the running of the Breeders Cup. Maybe you just want a great place to spend your time when you are not at the track. Another Hollywood Hills venue, the Hollywood Hybrid Estate, provides the perfect dose of exclusivity and luxury for discerning race fans. Great views, modern design, and lush natural surroundings make this property the perfect counterpoint to the buzzing excitement of Santa Anita. The estate is large enough that you can host a small special event during your stay as well. And, the Hybrid Estate has LEED Gold status, making it one of the most environmentally-friendly luxury rental options in all of Southern California. You can also peruse our other exclusive event-hosting venues on our website. With over a dozen options in the Los Angles area, and many more in nearby regions, you can easily find something to fit your Breeders Cup event-hosting needs. Are you planning to attend the Breeders Cup this year? What are you looking forward to most on race weekend?